Installing window shades in your home is an immediate and easy way to dress up your home while adding personality. The key difference between shades and blinds are that shades are typically made from one piece of fabric as opposed to the separate components that make up a blind. They come in a variety of shapes and textures so let’s take a look at seven types of window shades today. Cellular shades, otherwise known as honeycomb, are the most energy efficient of the shades available today due to their construction. From the side, they have diamond-like shaped cells from the two pieces of fabric that appear pleated but are actually open to create a pocket. This pocket allows for insulation of both heat and air and can also insulate sound. The cells come in many sizes to accommodate the needs of your home. 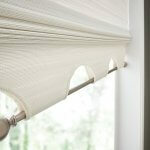 Pleated shades are one piece of material that folds up to look like an accordion. The edges of these shades are more pointed and have sharper edges as opposed to their cellular counterparts. They look a lot like blinds and they give the same “softening” look with light as traditional blind does. Pleated shades can be made from paper or fabric. Fabric shades are the most popular of shades and are the most versatile of all types. They can be ordered in a variety of fabrics and textures to coordinate with the décor in any room. They are also easy to clean and tend to hold their color longer than other shades. Natural shades allow you to bring the outdoors inside your home. They are woven from organic materials such as bamboo, grasses, reeds, and jute. They can come in many styles that add a sustainable pure look to your home. Roman shades give a gentle elegance to a room with their soft folds. They delicately fold into the shape of an accordion when raised and smooth out as they are pulled down. Roman shades also offer wonderful light control and give a room a more traditional appearance. However, the fabric can stack thickly at the top when raised only allowing a partial view of the exposed window. If you want your room to have a more streamlined and clean appearance roller shades are an excellent choice. They are made of a piece of single fabric and are controlled at the top with either a spring roller or motorized mechanism. One benefit of roller shades is that when they are raised they offer a full view of the window. Roller shades also provide light blocking of a room as needed. Rooms that need UV and glare protection need solar shades. These shades are similar to roller shades but they provide more light blocking and can be considered the “sunglasses” for your windows. They are also optimal for heat insulation in the winter and keeping rooms cooler in the summer. Every home and room are unique and at Made 4 U Shades we offer custom-created window treatments to fit everyone’s needs and budget. We will work with you to bring personality to your home that is versatile and functional. Our prices are competitive, and we offer installation of our products and can bring samples to your home as well to help you envision your completed work. Contact us today for more information.